A cat’s hideous screech. A door slammed in a distant room. Icy fingers ghosting down your spine. Halloween is nearly upon us, and to celebrate one of my favorite holidays, I have written you a scary short, short story. Enjoy! I come home to find a child’s shoe, just one, in the middle of my kitchen floor. Soiled red, the lace’s torn as though gnawed through. It almost looks familiar, but I have no kids. I have no wife. I live alone in an antiquated one-story, two-bedroom house. Before now, all the disturbances had been subtle. The living room blinds drawn when I was certain they shouldn’t be. The black pillow on the wrong side of the bed. But the doctors said that was normal. After the car accident, after the trauma, the mind had a tendency to fragment. When glass shatters, you can’t expect to find every shard. The dark wind drags its teeth across the windows, a faint howl as though the trees lament every leaf plucked from their gaunt limbs. I approach the shoe timidly, glancing at the backdoor. I pause, though, as another curiosity appears. An unwashed knife in the sink. These past few months, I had been dismissing such irregularities under my clinical absentmindedness. But that knife, that particular knife came from my mother. Came in a set I hadn’t opened yet. My shirt feels terribly constrictive as I double-check the locks on both doors. Outside, the decaying night pleads for entry, but I turn on every light in the house, turn on the television, the radio, unconcerned for the fragility of my breakers. 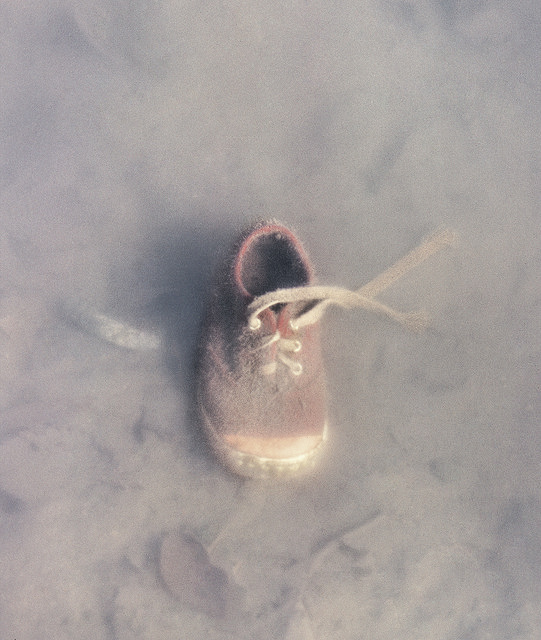 A child’s shoe…I debate calling the police, but nothing was stolen. Nothing was broken. Maybe it’s a prank. Probably Ryan—he still acts as though we never graduated college. And when I realize that, I return to the kitchen to discard it. But the shoe is gone. My heart feels like it beats against a rusty nail, my lungs as though a rope is snarled through them. And that’s when, with a hollow pop, the lights go out. I close my eyes. This is just a trick. Ryan. He is waiting to scare me. I should call out defeat, but my throat is struggling enough just trying to breathe. I retread the path to my room, my dumb and grasping hands encountering deformed masses, hooded emptiness. Maybe I threw the shoe out earlier. Washed the knife right then. The physician said that was normal; the sutures in my psyche bound to fray. The flashlight is at the bottom of my nightstand, and when I fumble to turn it on, a dull light leaks out. And turning toward my door, a figure is outlined in the frame. In his other hand is the knife, and streaking like a final scream, he lunges toward me. You really have a way with words Jake. Excellent !! Thanks, Patty! The kind words are greatly appreciated. I’ll be seeing you soon! The difference between your blog, and the other blogs I read, is that you are a writer first, blogger second, which makes your blog much better and more readable, than others, who are teachers/lawyers/accountants/researchers/whathaveyou first, and blogging is a distant second or third or tenth, and writing is in last place. Write on!